The Effects of Cool and Warm Temperature on Selected Physiological Variables. 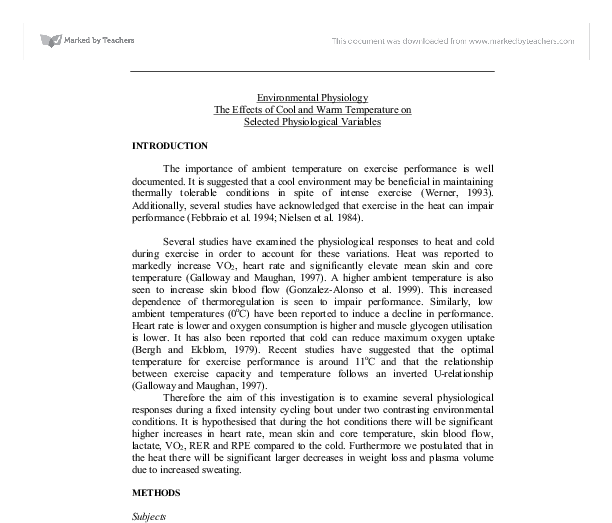 Environmental Physiology The Effects of Cool and Warm Temperature on Selected Physiological Variables INTRODUCTION The importance of ambient temperature on exercise performance is well documented. It is suggested that a cool environment may be beneficial in maintaining thermally tolerable conditions in spite of intense exercise (Werner, 1993). Additionally, several studies have acknowledged that exercise in the heat can impair performance (Febbraio et al. 1994; Nielsen et al. 1984). Several studies have examined the physiological responses to heat and cold during exercise in order to account for these variations. Heat was reported to markedly increase VO2, heart rate and significantly elevate mean skin and core temperature (Galloway and Maughan, 1997). A higher ambient temperature is also seen to increase skin blood flow (Gonzalez-Alonso et al. 1999). This increased dependence of thermoregulation is seen to impair performance. Similarly, low ambient temperatures (0oC) have been reported to induce a decline in performance. Heart rate is lower and oxygen consumption is higher and muscle glycogen utilisation is lower. It has also been reported that cold can reduce maximum oxygen uptake (Bergh and Ekblom, 1979). Recent studies have suggested that the optimal temperature for exercise performance is around 11oC and that the relationship between exercise capacity and temperature follows an inverted U-relationship (Galloway and Maughan, 1997). 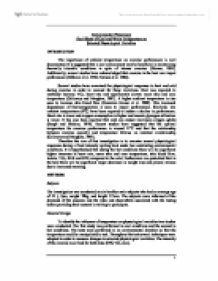 Therefore the aim of this investigation is to examine several physiological responses during a fixed intensity cycling bout under two contrasting environmental conditions. It is hypothesised that during the hot conditions there will be significant higher increases in heart rate, mean skin and core temperature, skin blood flow, lactate, VO2, RER and RPE compared to the cold. Furthermore we postulated that in the heat there will be significant larger decreases in weight loss and plasma volume due to increased sweating. METHODS Subjects The investigation was conducted on six healthy male subjects who had an average age of 22 + 2yrs, weight 78kg, and height 175cm. ...read more. Mean skin and core temperature during exercise in the heat and cold Blood Lactate: Resting concentrations for lactate were similar in cold and hot conditions (1.27 + 0.61 and 1.17 + 0.5 respectively). Throughout the test in both conditions the lactate concentrations increased significantly (p = 0.000, P < 0.05). Figure 4 shows that this increase is significantly higher in the hot conditions when compared to the cold (p = 0.000, P < 0.05). In the hot, concentrations reached 4.4 mmol whereas in the cool the levels only reached 2.04 mmol. Significant interaction between temperature and time is also evident for blood lactate (P < 0.05). Figure 4. Lactate concentration during exercise in the hot and cold. Skin Blood Flow. During exercise skin blood flow increased over time in both conditions (p = 0.000, P < 0.05). Initially in the cool conditions concentration increased but then hits a plateau at around 5 minutes, whereas in the hot condition skin blood flow carried on increasing with no plateau occurring within the exercise duration (Figure 5). The distinction between the two environmental conditions can be seen clearly and furthermore this difference is statistically significant (p = 0.001, P < 0.05). The results also indicate significant interaction between time and temperature (P < 0.05). Figure 5. Skin blood flow during exercise in hot and cold conditions Plasma Volume Responses: The change in plasma volume was significantly different between trials (p = 0.015, P < 0.05). Plasma volume decreased in both environmental conditions between rest and the 30-minute sample time (p = 0.000, P < 0.05). However the decrease in the hot conditions was larger in the hot compared to the cold shown quite clearly in figure 6. The end percentage decrease in plasma volume was 9.75% in the hot compared to 5.45% in the cold. The statistical analysis shows that there is no significant interaction between the two factors (P > 0.05). ...read more. They found that changes in the measures were consistent with a significant reduction in plasma volume during exercise in the heat. This increased loss in the heat is due to increase amounts of sweating and fluid shifts. VO2. The literature in the area of VO2 is inconsistent and several studies have found conflicting results. The results from this investigation seem to show that VO2 was lower in the cold conditions compared to the hot. The results are supported by Fink et al. (1975) who observed a higher VO2 in the heat (41oC) compared to a cold environment (9oC). However, Galloway and Maughan (1997) found that VO2 was lower in the hot (31oC) trial compared to cooler tests and suggested that these variances in studies may be related to factors such as intensity, protocol that influence oxygen cost of exercise. Weight Loss. The data generated in this study show that weight loss occurred under both conditions. This weight loss was down to water loss via sweating and therefore because the subjects sweated more in the hotter environment they consequently had a greater weight loss than when the test was performed in the cold. This variable shows a close correlation to plasma volume responses described above. CONCLUSION The results generated in the above study and current literature suggest that performance is favoured in the cold conditions. It has been highlighted that an increased core temperature is a major limiting factor during exercise (Gonzalez-Alonso et al. 1999). Furthermore it is evident that the increased stress placed upon the body in order to regulate the body's temperature impairs mechanisms needed for optimal performance. Skin blood flow was increased dramatically, which impaired O2 delivery to the working muscles and consequently increased lactate concentration. However no strong conclusions can be made on temperatures effect on performance because a major limitation of this study was that no performance criteria were performed. Therefore if the investigation was to be repeated then it must be ensured that a time to exhaustion and/or distance covered measurement be taken so that this area can be concluded properly. ...read more. I will there fore improve this during my personal exercise programme. Aim: The aim of my exercise programme is to improve my cardio vascular fitness. To do this I will attend the gym 3 times a week for 5 weeks following a schedule on the previous page. pasta or rice. Protein Proteins are the prime importance because they are the building blocks which make up the structures of the body. Muscle, skin, bones, internal organs, cartilage and ligament all have a protein component. We gain our protein by eating protein rich foods as red meat, fish, chicken, eggs and dairy products. He believes the functions of muscles simply prevent VO2 from increasing further, and therefore VO2max does not exist. The discrediting of Hill and Lupton's work by Noakes is based upon the view that Hill only demonstrated experiments that illustrated a plateau and that he did not supply enough experimental evidence to support the theory of the VO2 plateau.